Ok here's the situation. I get a decent amount of email. We all get a decent amount of email. Most of it is not worth being distracted by. We want to be doing deep, valuable work and not get interrupted every 5 minutes from some company trying to sell you something. Other times its things that are important, but not urgent and it can wait for later. Our attention is valuable and others should not have a direct line of communication to interrupt us as they please. But some of the email is very important. Some of it is very beneficial to us. In this case, we choose to be notified. That's what I wanted. I wanted to only get notified for specific emails. Other emails should not beep, buzz, or blink my phone. Also, I want this to be configurable on just my mobile phone. So how do I do this? The first time I checked it wasn't possible. 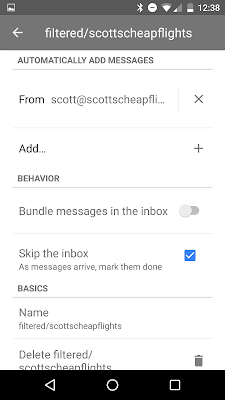 I have an Android phone and use the Inbox app.. Inbox does have a way to manage filters Inbox doesn't have a way to customize messages based on label. I was actually planning on building something specifically for this. Maybe it would be my next project in my 12 projects in 12 months challenge. However, I found a way to do this without needing to write any code. Here's how you do it. You need to use a combination of Gmail AND Inbox. So let's say that I am looking for a travel deal and sign up for Scott's Cheap Flights. 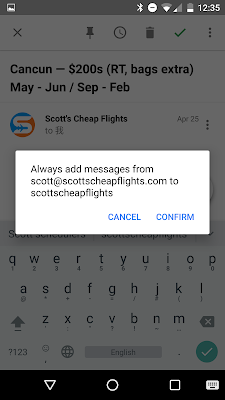 Scott sends out an email whenever there is a travel deal. Since these are time sensitive, its best to get notified right away so I can quickly check if it is to a place of my liking and book. 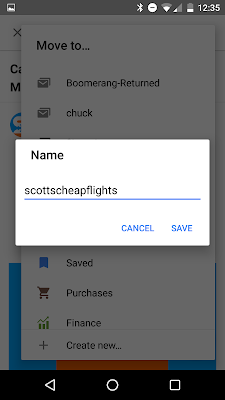 So the first thing to do is for me to create a label for Scott's Cheap Flights. For this I need to use Inbox. 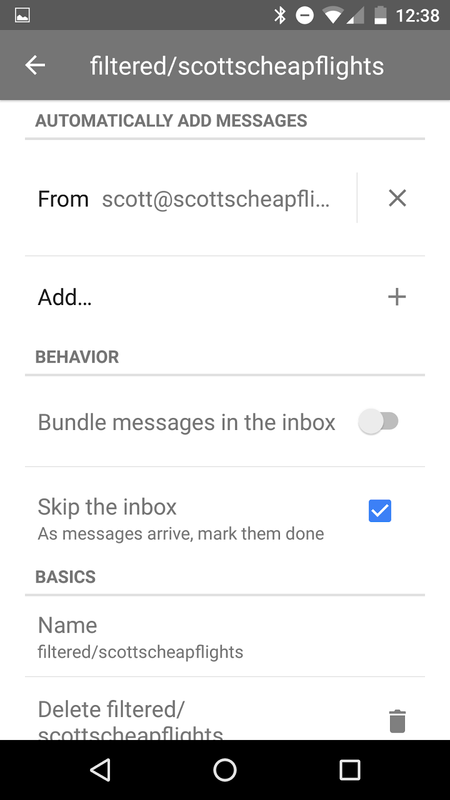 Pull up an existing email from Scott and there will be a pulldown on the top right. Select "Create new..."
I would recommend having "Skip the inbox" on. Its time sensitive but not really something you want to see again in your inbox if you miss out. Ok. So you are done creating the label. 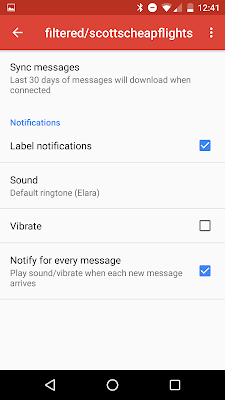 How do you get notified? The Gmail app has the ability to to set messaging specific to a label. Settings > (email address) > Manage labels > (label name). From here you can check label notifications. You can even set a label specific Sound. 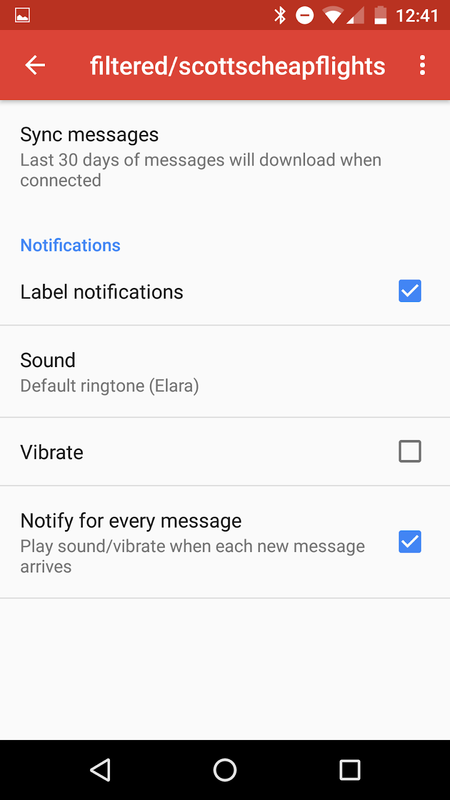 For this to be useful, I would also recommend going to your Inbox label (in Gmail app under the Manage labels setting) and disabling label notifications as well as notifications in your Inbox app. Otherwise you would still be notified for all incoming email. That's it. And all of this can be done on the fly with your mobile phone. So I decided to not build the app myself and just went with this solution. It is a bit annoying to have both Gmail and Inbox installed but I can live with it. Also, it would be lovely if Inbox supported editing filters to get a little more drill down into labels. 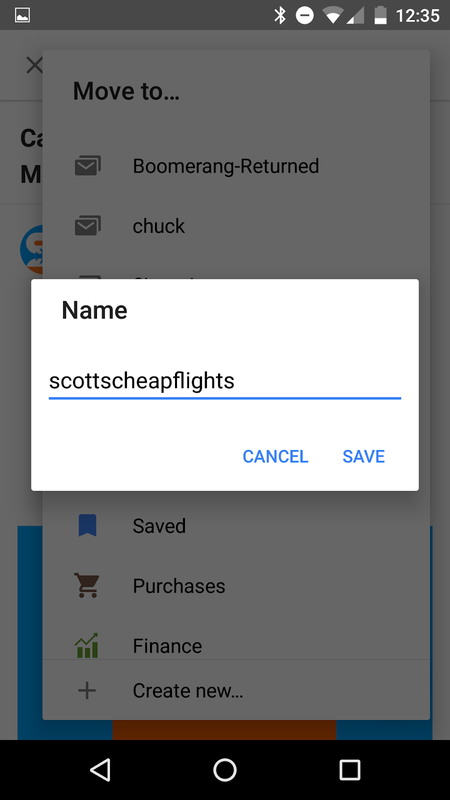 For example you can use your filter to detect keywords so you can have a scotts cheap flights + for Bali label. You can still do this via the Gmail web interface but it would probably require you to get on your laptop.